So this isn’t going to be an in-depth blog entry, as I spent the time I should have been doing that on sitting down and planning. You see things might be changing at the pottery soon and there will be a proper announcement when it happens. But cutting the story to a non existent tale I need to start taking the pottery seriously and actually try to build an audience. Not everything on here is a priority, I know which I should be working on now and which are long term goals. My priorities are taking some better photographs and need a better setup than I currently use. Actually trying to actively share my posts/YouTube videos further than my own social media.I means leaving my comfort zone and stretching myself, I have some real targets I know I have to at least try. My idea is to market as much as I can for free, not sure if I was targeting with actual money to actually make some real connections. My goal is to get into the studio on a Friday and make the most of it, probably send an hour filming and two making. Time is so precious and there isn’t enough of it on a day to day basis to get everything. And when I’m at work, actually try and get to the beach to sketch and collect seashells for the experimental firings. With my drawing I really want to continue to push forward, I need to be more focused in some areas, I have reminders on my wall of various images that I aspire to. To be honest there is a massive leaning in my goals towards boats still and that’s because I am not close to achieving goals I made last year. Seeing some of my short to medium term goals written out in front of me seems daunting and it would be easier to try and cull goals but I tried that before and I just ended up feeling like I had wasted several years. I think though I need to develop some projects that ensure I actually focus down on the important goals, not quite sure yet, I’d like to do a finished illustration a week but that still feels too adventurous and unattainable at the moment. 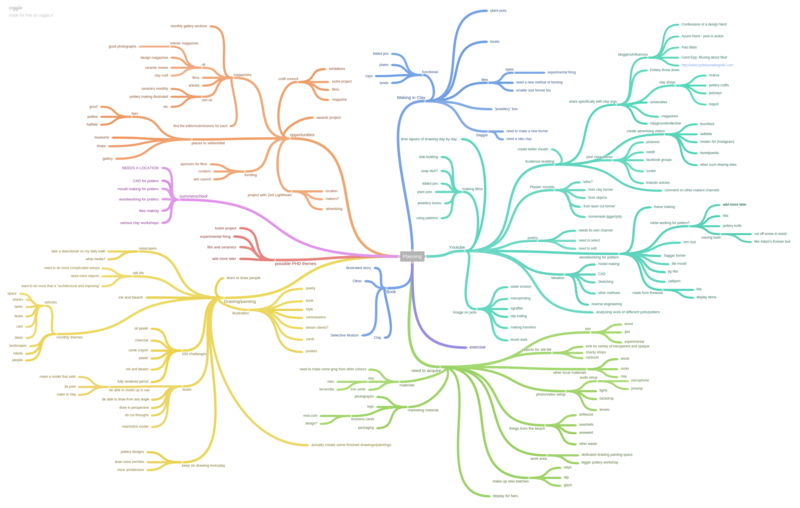 I can recommend mind mapping it helps me build ideas quickly, the one on this post was made using Coggle which has a free option, which has some limits but for free software is better than some of the paid for software that I used as a student teacher. This entry was posted in planning and tagged ceramics, goals, learning, making, mindmapping, self promotion, youtube. Bookmark the permalink.